So socks are my go-to, always have those on my needles, project (well except at this current moment but I think that issue will be remedied very soon). It’s kind of a safety blanket for me, going wherever I go regardless of whether or not I think I’ll be knitting. From left to right: Vanilla Socks (#22), Seed Stitch Socks (#23), and my Goodwill Socks (#24). I guess my next pair of socks will be my 25th pair! I really do need to update my ravelry with my old socks that I had made for Christmases past. I like simple patterns for bus sock knitting. It’s not dry enough for without-looking-movie knitting, but it’s simple enough to not need to glance down at my phone every other second remembering the pattern. On another note, check out this artist, Benoit Jammes’ work. I stumbled on this artist via thekitchn.com and I was absolutely enamored by the cassette series he did. Thinking about the ephemerality of so many forms of media and how many exist out there, finding a quirky and amusing use for these physical (now defunct) shells of entertainment really caught my eye. Now that Christmas has come and gone, gifts finished and (mostly) given out, I can share the loot. 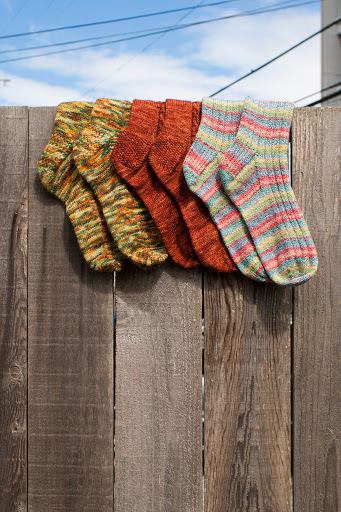 Well 90% of my knitting was socks, and 3 of those are mens socks (which take FOREVER). The hat I made was a Peppermint Hat from the Interweave Gifts edition from 2012. And it was an absolute joy to knit. I finished it within days, didn’t even swatch (no time to at that point!) and loved the yarn a lot. So much so, I decided to make some matching mitts with the same yarn, improvising the color chart to match. I did get the other two pairs of socks that aren’t up there on the recipients’ feet. Yay for use pictures! That always warms my heart…even more adorable was that my brother (who’s feet are in the blue socks) was worried about wearing them with shoes. I then proceeded to tell him that the more worn out hand knits are, the more complimented I feel, as knits are to be used as much as possible and are a sign of love. *There are so many different t ypes of movie/tv-knitting relationships, brainless knitting is for the very intense movies that I can’t look away from. I’ll write about Germany later but for now, as I’m sipping my final pint (of who knows how many, admittedly, this trip) I decided to set forth mother challenge: the great sock rush. 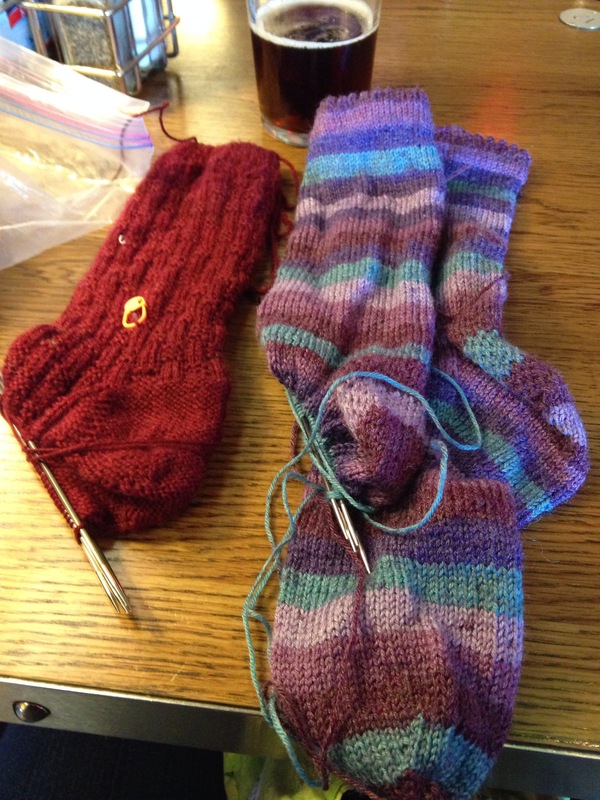 With Christmas fast approaching, I’m hoping to finish these two socks. I finished two hats and had worked on these two socks on the first leg of my journey (I’m writing this in a pub in London Heathrow). Now to see if I can finish them on my 9hr flight back to Seattle. The challenge is on!